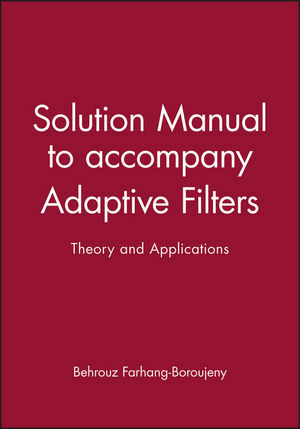 The Solution Manual to accompany Adaptive Filters: Theory and Applications offers a helpful resource for understanding the latest developments in this field. The Manual offers increased coverage given to the practical applications of the theory to illustrate the much broader range of adaptive filters applications developed in recent years. The Manual includes an easy to understand approach to the theory and application of adaptive filters by clearly illustrating how the theory explained in the early chapters of the book is modified for the various applications discussed in detail in later chapters. Behrouz Farhang-Boroujeny is the author of Solution Manual to accompany Adaptive Filters: Theory and Applications, published by Wiley.